Seriously... Or Quora is clickbaiting. My kids are unvaccinated. What essential oils can I use to prevent them from catching measles? No. He's another religious nut, using the Bible's prescriptive 2000 year old cures. Most plagues have very common symptoms, usually mistaken for the flu. For example, Polio's symptoms were almost identical to the flu, except it left the victim paralyzed. Measles is also almost always mistaken for the flu also. Quarantine is not the answer, as the measles is extremely contagious. Wow I haven't been on the forums for a bit but I saw this thread and it's something I am pretty deeply concerned about as I now have a 3 year old daughter. She is vaccinated and I even paid for the chicken pox vaccine before it became subsidised because I will protect her in whatever ways I can. My wife and I got vaccinated for Whooping Cough while she was pregnant (as recommended) to protect her in utero and so we would protect her after that. It sickens me that there are still so many anti-science folk who do not vaccinate and put not only their children at risk, but other citizens who are unable to be vaccinated for medical reasons, and rely on herd immunisation are also being put at risk. Measles is serious stuff, and can cause brain damage as well as mess up the body's ability to fight off other viruses. My daughter's daycare do ask for vaccination records, but they do not enforce anything. I am unsure if I have the right to ask for the vaccination rates or anything from the daycare provider though. Essential oils? Don't be silly. Everyone knows they don't work against measles. Instead I recommend homeopathy. And as always, removing this type of content makes the believers hunker down and feeds upon their sense of persecution. "See? This is proof that big pharma is scared of what we have to say, so we must be right!" FWIW, I understand that MMR vaccination rate for 5YOs in NZ is about 88% / 12% aren't vaccinating their kids. Homeopathy is the medical name for essential oils! Duh! Homeopathy is not the medical name for anything, because there is no science in homeopathy. /Even if you meant as a joke. freitasm: Homeopathy is not the medical name for anything, because there is no science in homeopathy. Perhaps I should have added /s to indicate it. kingdragonfly: No. He's another religious nut, using the Bible's prescriptive 2000 year old cures. I spent a lot of time in America when I was little. That was a long time ago and I vividly remember the polio epidemics and the March of Dimes. The development of the Salk vaccine was celebrated as a near-miracle by almost everyone. Images of children trapped in iron lungs faded away. I didn't get polio and neither did anyone I knew. This, along with antibiotics and the eradication of smallpox, was one of the great triumphs of 20th-century medical science. And now that is being replaced by morons howling at the moon. I hope polio doesn't return. It is a nasty, evil disease that steals childhoods and futures. Shame, shame, shame on the uninformed cretins who push this nonsense over the backs of their children! 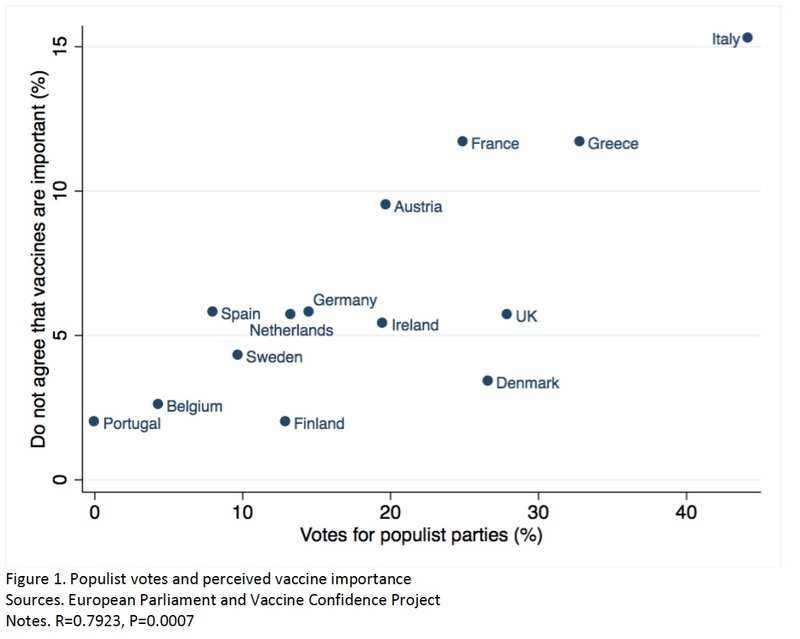 All this says is that people who vote for populists are not very bright or well-informed. No surprises there. This. There will always be extremist idiots who want to wallow in conspiracy theories. Those who actually take this kind of crap seriously should be able to access it if they are willing to go to the trouble under the principle of free speech. But taking the content out of the mainstream and sticking it in a dark corner in a back room delegitimises it and presents it as the mindless rubbish it really is. I am not defending Anti-Vaxxers because as I have made really clear, I despise them and the entire process they follow. Having said that, whilst information seems freely available, and there would seem to be no excuse, the reality is that not everyone has good sources of information. Being a parent is tough going at the best of times, and you throw in cultural, environmental, and other influencers and take into account the number of scary but on the surface, credible hoaxes running around, as a busy tired, stretched thin parent, I can see how people end up with opinions that Vaccinations have negative effects. Protecting your kids is a scary daunting job, and you are only as good as the information you are fed. If you are only fed anti vaxx information..... In an ideal world every parent would balance every decision they make on a cross section of opinions or experiences and evidence, but the reality is somewhat less ideal. There is also other less flattering aspects for it too, but I am saying that not all parents who choose not to Vaxx thier kids are doing so to hurt them deliberately. I have seen and heard a few heart breaking stories of parents who truly felt that had made the right choice, seeing their kids sick and realizing what they had done. I can't imagine the misery that would cause. Sometimes consequences aren't real until they are experienced.